I love watching my kids grow up. I learn something new about them every day. But it also gives me pangs of sadness when I realize that each passing moment is history. I will never get this time back with them. I look at photos of my 4-year-old as a baby and I feel like I barely remember those days! My 16-month-old is toddling around and I will never hold his newborn body in my arms again, I will never feel that new-mom vulnerability, never feel the intensity of having a new baby completely dependent on me every moment. There is nothing we can do to hold onto this time as mothers of babies and small children, but Baby Bee Hummingbirds offers something just short of freezing time. This Australian-based company creates beautiful and treasured BreastMilk & Keepsake Jewellery. What I find unique about this company is that she also creates keepsakes from First Curls, Cord Stump, Baby’s Placenta, First Tooth, and a Loved One’s Ashes. She told me that someone asked if they could have a keepsake made from formula and she said, “of course!” This company is not exclusive, her mission is to create keepsakes that capture the unique relationship of each mother and child, whatever that may be. These keepsakes have grown in popularity and as with anything new there has been much speculation as to the trustworthiness of some of the business owners. With something so deeply personal it is vital that a company be reputable. Over the past few months I have developed a friendship with Amy McGlade, the owner and creator of Baby Bee Hummingbirds. Amy is a passionate breastfeeding Australian Mumma of 3 and Practicing Midwife of 10 years. Every single piece of BreastMilk & Keepsake Jewellery is lovingly handcrafted & soulfully infused by Amy. Baby Bee Hummingbirds was founded in January 2014 after Amy began crafting BreastMilk & Keepsake Jewellery for her own family and friends. Baby Bee Hummingbirds quickly grew to a much loved and trusted worldwide business, gaining groundbreaking Australian Customs approval to import & export BreastMilk and Human DNA (this allows a safe & secure passage for all precious inclusions). Tribe Baby Bee (as they lovingly refer to the growing number of parents who cherish their keepsakes) has organically grown & has welcomed Lee-Marie (Amy & Lee-Marie have been childhood friends and live on the same street). Lee-Marie is a Mumma of 2 small boys, who expertly oversees the running of the day to day business activities. I put Baby Bee Hummingbirds to the test with my own breastmilk. I asked to have keepsakes made from my milk and from my children’s handprints. I chose not to be too specific and asked that Amy create from her heart. You can be as specific as you like. Amy mailed me a hand print kit and I took the hand prints of my 2 boys, Jack and Exley, which was fun in and of itself! 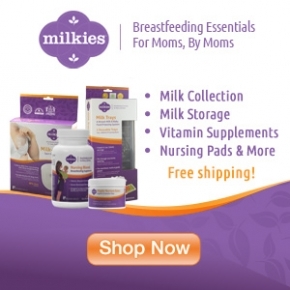 I mailed the kit and 30mls of my breastmilk back to her in Australia from my home in Chicago. Baby Bee Hummingbirds is a worldwide company and offers free postage. About 4 weeks later (their standard turnaround time is 4-8 weeks), I received these gems in the mail. A bead made from my breastmilk that says, “Badass Mama,” and a hand print of each of my sons along with their first initial on the back. If you live in the US you might feel that Australia is too far, but just let the post office and the mailman do the work for you. It is absolutely worth it to have Amy create your keepsake. Baby Bee Hummingbirds now offers DIY Kits! You can make your own keepsakes at home without sending anything out of your home. I made a ring with breastmilk with one of these DIY Kits. You can watch the video below! It’s easy. If I can figure it out anyone can! Be sure to follow Baby Bee Hummingbirds on their website, Facebook, Instagram and Twitter to get all of their offers. Review of gDiapers by The Badass! I have been emailing back and forth with her too! And have a few pieces I would love made! I am so thankful for your blog post right now! My only concern was shipping from the states to her since it is a liquid. You have now calmed my fears! I will be ordering ASAP! After I see if I maybe win! That would be so awesome!! This is just something so precious and want to get a few pieces made for my first born now before its too late, ill be doing the same for my future children too, something nice to look back on! Just amazing! I love her jewelry. I wanted to get a breast milk and placenta charm when my daughter was born but didn’t have the funds. She makes such beautiful items! Love this necklace. I truly hope I win. I feel so Damm proud of myself and my babies. Because without them I could not have done it. Breastfeed 100%. I recently learned that this company is destroying Embryo’s for the purpose of creating jewelry. Have people no regard for humanity anymore? I am literally rendered speechless at how atrocious this is. It is absolutely vile and disgusting. Please, you could do a good thing and forgo that area of your business. Give babies a chance to live and stop destroying life! It is horrific that a mother could work so hard and suffer with ivf to give LIFE ,but then feel “Good” about having it KILLED and turned into jewelry! How warped and twisted can you get!? !